Designed for 24 Volt motors up to 120 Watts. Maximum current 10 Amps. Under Voltage protection 20.5 Volts. Current limiting feature helps prevent controller and motor damage due to over-current conditions. Under voltage protection feature helps prevent over-discharge and extends battery life. 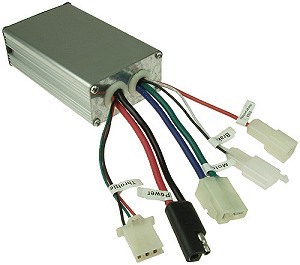 Uses standard 3-wire variable speed hall-effect throttle. Designed for 24 Volt motors up to 150 Watts. Maximum current 15 Amps. Under Voltage protection 20.5 Volts. Current limiting feature helps prevent controller and motor damage due to over-current conditions. Under voltage protection feature helps prevent over-discharge and extends battery life. Uses standard 3-wire variable speed hall-effect throttle. 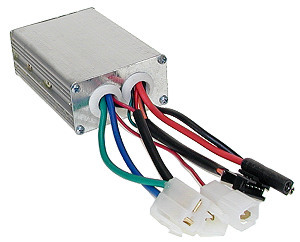 Designed for 24 Volt motors up to 250 Watts. Maximum current 20 Amps. Under Voltage protection 20.5 Volts. Current limiting feature helps prevent controller and motor damage due to over-current conditions. Under voltage protection feature helps prevent over-discharge and extends battery life. Uses standard 3-wire variable speed hall-effect throttle. Designed for 24 Volt motors up to 350 Watts. Maximum current 25 Amps. Under Voltage protection 20 Volts. Current limiting feature helps prevent controller and motor damage due to over-current conditions. Under voltage protection feature helps prevent over-discharge and extends battery life. Uses standard 3-wire variable speed hall-effect throttle. 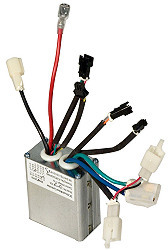 Designed for 24 Volt motors up to 500 Watts. 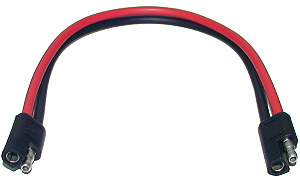 Most commonly used on older model Razor scooters and bikes with 250 and 350 Watt motors. Maximum current 30 Amps. Under Voltage protection 20.5 Volts. Current limiting feature helps prevent controller and motor damage due to over-current conditions. Under voltage protection feature helps prevent over-discharge and extends battery life. 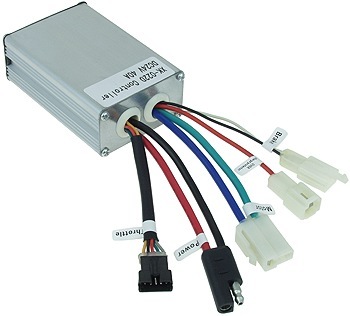 Uses standard 3-wire variable speed hall-effect throttle. Designed for 24 Volt motors up to 450 Watts. Maximum current 35 Amps. Under Voltage protection 20.5 Volts. Current limiting feature helps prevent controller and motor damage due to over-current conditions. 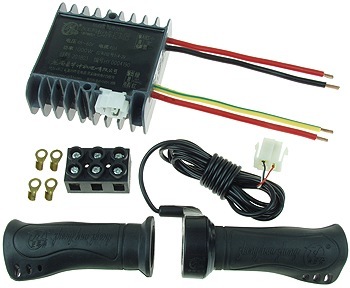 Fits Currie Electro Drive 450 Watt electric bicycle conversion kit plus eZip and IZIP electric bicycles that have controllers with the same or less connectors. Some controllers that this one replaces have wires coming out of the long side instead of the short side of the case like this controller does. 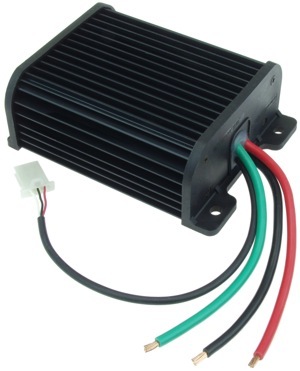 Replaces model numbers: 24V 35A / 24V 1-4V 35A / CT-2435-003 / DM-CB24-PAS / DM-140LA. Designed for 24 Volt motors up to 500 Watts. Maximum current 30 Amps. Under Voltage protection 20.5 Volts. Current limiting feature helps prevent controller and motor damage due to over-current conditions. Under voltage protection feature helps prevent over-discharge and extends battery life. 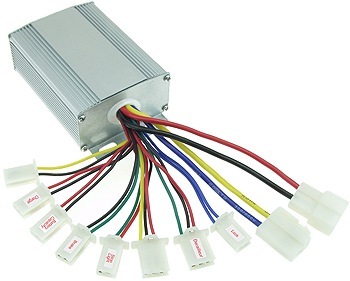 Uses standard 3-wire variable speed hall-effect throttle. Mounting tabs on back side of controller. Fits many common electric scooter and bicycle models. 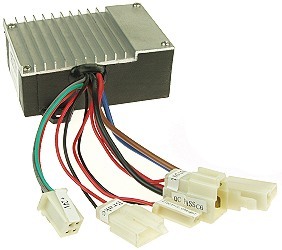 Reversible speed controller operates in either forward or reverse mode. Designed for 24 Volt motors up to 500 Watts. Maximum current 30 Amps. Under Voltage protection 20.5 Volts. Current limiting feature helps prevent controller and motor damage due to over-current conditions. Under voltage protection feature helps prevent over-discharge and extends the life of the battery pack. 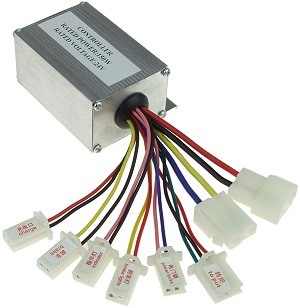 Uses standard 3-wire variable speed hall-effect throttle. 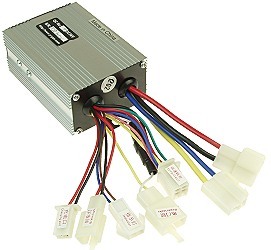 Designed for 24 Volt motors up to 600 Watts. Maximum current 30 Amps. Under Voltage protection 20.5 Volts. Current limiting feature helps prevent controller and motor damage due to over-current conditions. Under voltage protection feature helps prevent over-discharge and extends battery life. 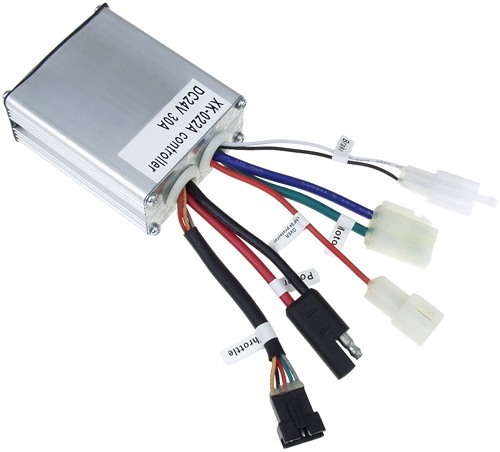 Uses standard 3-wire variable speed hall-effect throttle. Fits Currie, eZip, IZIP, Schwinn, GT, and Mongoose electric scooters that have a 3-wire throttle. 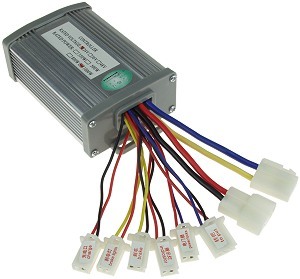 Designed for 24 Volt motors up to 600 Watts. Maximum current 30 Amps. Under Voltage protection 20.5 Volts. Current limiting feature helps prevent controller and motor damage due to over-current conditions. Under voltage protection feature helps prevent over-discharge and extends battery life. Fits eZip, IZIP, Schwinn, GT, and Mongoose electric scooters that have a 5-wire throttle. 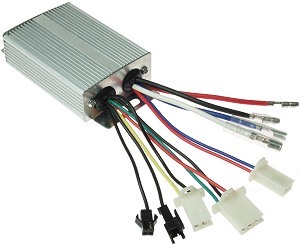 Designed for 24 Volt motors up to 600 Watts. Maximum current 30 Amps. Under Voltage protection 20.5 Volts. Current limiting feature helps prevent controller and motor damage due to over-current conditions. Under voltage protection feature helps prevent over-discharge and extends battery life. Fits eZip, IZIP, Schwinn, GT, and Mongoose electric scooters that have a 6-wire throttle. 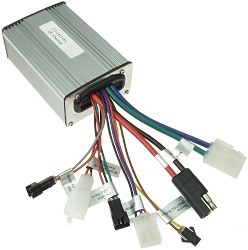 Designed for 24 Volt motors up to 900 Watts. Maximum current 40 Amps. Under Voltage protection 20.5 Volts. Current limiting feature helps prevent controller and motor damage due to over-current conditions. Under voltage protection feature helps prevent over-discharge and extends battery life. Fits eZip, IZIP, Schwinn, GT, and Mongoose electric scooters that have a 5-wire throttle. 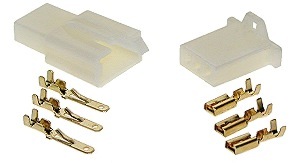 Robust heavy-duty design with large heat sinks and thick 10 gauge wires. Epoxy encapsulated electronics for a high level of water resistance. 24-36 Volt input range. 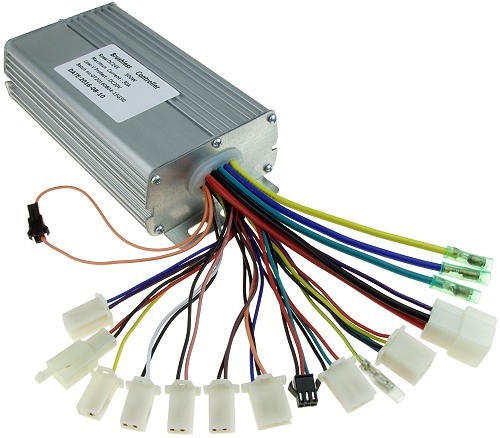 Designed for 24 Volt motors up to 600 Watts and and 36 Volt motors up to 900 Watts. Current limiting feature helps prevent controller and motor damage due to over-current conditions. Includes a standard variable speed hall-effect twist throttle with matching left hand side grip. Works with both 24 and 36 Volt battery packs. 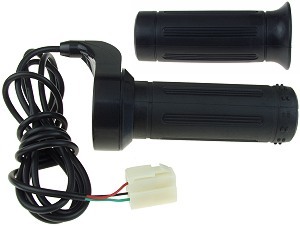 Plug-and-play replacement twist throttle for item # SPD-36900A speed controller sold above. Includes matching left hand grip. Designed for 24 Volt motors up to 1000 Watts. Maximum current 45 Amps. Under Voltage protection 20.5 Volts. Current limiting feature helps prevent controller and motor damage due to over-current conditions. Under voltage protection feature helps prevent over-discharge and extends battery life. 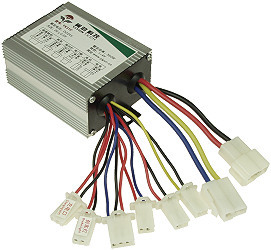 Uses standard 3-wire variable speed hall-effect throttle. 24-36 Volt input range. Suitable for 24 Volt motors up to 1200 Watts and 36 Volt motors up to 1800 Watts. Maximum current 50 Amps. Heavy-duty design with large cooling fins for demanding applications. Current limiting feature helps prevent controller damage due to over-current conditions. Compatible with standard 3-wire variable speed hall-effect throttles. 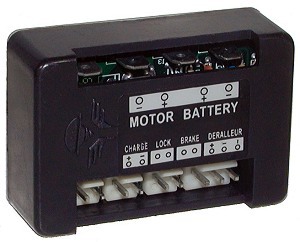 Works with both 24 Volt and 36 Volt battery packs. Speed controller for eZip® Coastline and Trailz plus IZIP® Mountain Trails, Trailz, Skyline, and Urban Cruiser electric bicycles. Model 24V 35A, CTE-2435-002, and CB24-YR8. This controller is for bikes that have two brake switch connectors (one connector for each brake lever switch cable). 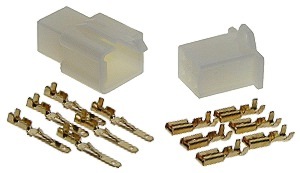 Can also be used with bikes that have one brake switch connector by not using the second connector on the controller. If you do not know which controller to get choose this one because it will work with all versions. Speed controller for eZip® Coastline and Trailz plus IZIP® Mountain Trails, Trailz, Skyline, and Urban Cruiser electric bicycles. Model: 24V 35A, and CTE-2435-001. This controller is for bikes that have one brake switch connector (both brake lever switch cables go to one connector). 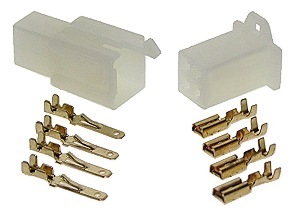 For bikes that have two brake switch connectors choose item # CTE-24436 sold above. 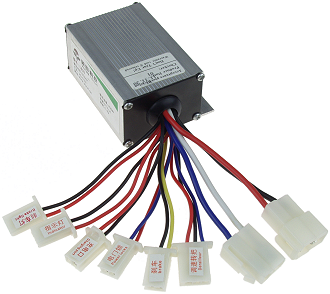 Designed for 24V brushless DC motors between 150W and 250W. 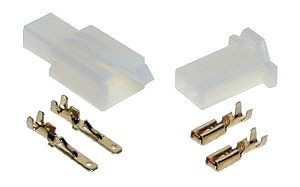 Replaces controllers with fewer connectors because most of the connectors are optional to use. Under Voltage protection 19 Volts. Current limiting feature helps prevent controller and motor damage due to over-current conditions. Under voltage protection feature helps prevent over-discharge and extends battery life. Compatible with standard 3-wire variable speed hall-effect throttles. 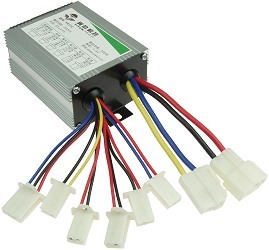 Designed for 24V brushless DC motors between 350 and 500 Watts. 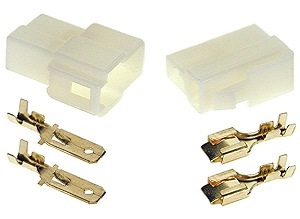 Replaces controllers with fewer connectors because most of the connectors are optional to use. Under Voltage protection 21.5 Volts. 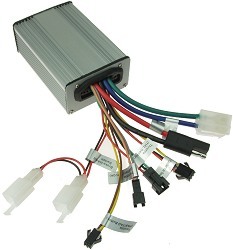 Current limiting feature helps prevent motor and controller damage due to over-current conditions. Under voltage protection feature helps prevent over-discharge and extends battery life. Compatible with standard 3-wire variable speed hall-effect throttles. 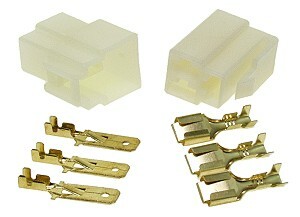 Two mating 2-Prong connectors attached to 11 inches of 10 gauge wire. Our 24 Volt speed controllers fit many common Chinese electric scooters and bicycles. 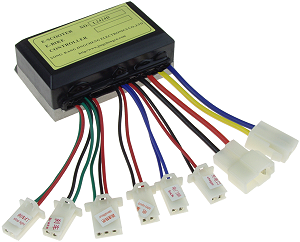 Speed controllers are also sometimes referred to as; controller, control module, module, brain box, control box, and Voltage controller.